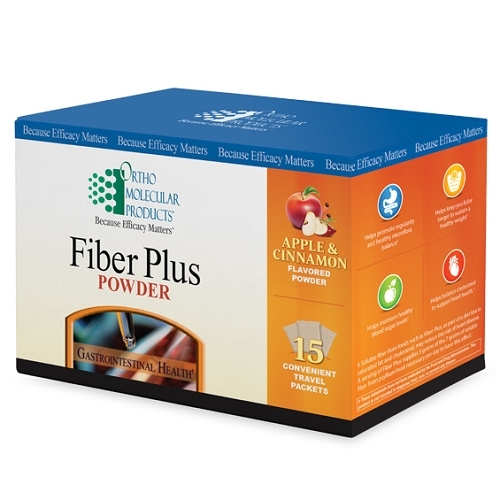 Now available in single-serving travel packets, Fiber Plus Powder comes in a delicious Apple Cinnamon flavor and is easy to take on-the-go. Occasional constipation affects 15-20% of the US population. It can be caused by stress, dehydration, or diet and lifestyle choices. The prevalence of refined sugars and carbohydrates in the modern diet, combined with the low presence of fiber, is linked to slowed bowel transit time and altered colonic environment. 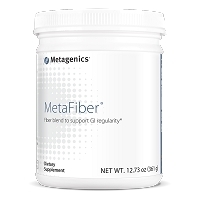 Dietary fiber, the indigestible part of plant foods, enables smooth bowel movements, prevents occasional constipation, and promotes healthy gastrointestinal (GI) microflora balance. Fiber Plus is a natural fiber supplement containing a balanced ratio of soluble to insoluble fiber to help with occasional constipation and maintain long-term bowel regularity. The main ingredient in Fiber Plus, psyllium seed husks, is one of the most widely used fibers in natural bulk laxatives. Both the psyllium seeds and husks used in Fiber Plus are 100% organic and free of the contaminants often found in other sources of psyllium. 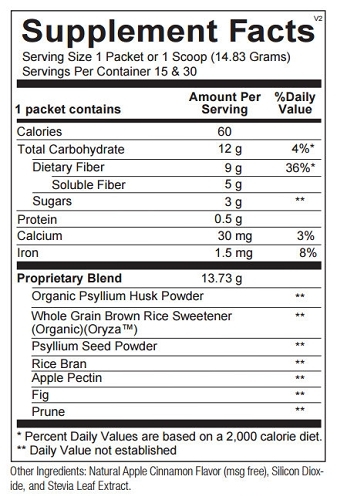 In addition to psyllium, Fiber Plus includes rice bran for its glycemic balancing effects and pectin, a soluble fiber found in apples. Fig fruit and prune are also included because they contain natural compounds which act as mild colonic stimulants to relieve symptoms of occasional constipation. Mix 1 packet (14.83 grams) in 8 oz of water or juice and drink immediately 1-2 times daily or as recommended by your health care professional.